The Thanksgiving holiday is a time to give thanks for our blessings, gather with family, and friends. It can also be a great time to develop wonderful family traditions that will leave lasting memories. Here are just a few traditional Thanksgiving activities and ideas you might want to incorporate into the season. Macy’s Thanksgiving Parade~ Turning on the television to watch the festive floats and giant balloons Thanksgiving morning. 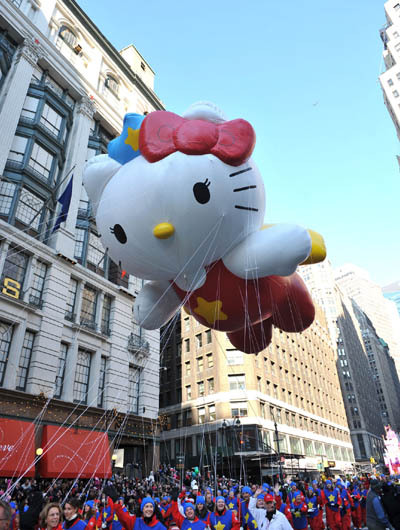 This year is the 85th Macy’s Thanksgiving Day Parade. Keeping the kids busy with crafts while Mom is preparing the food~ While your shopping grab some colorful construction paper for the kids to make Thanksgiving related crafts while you cook. Setting them up with paper, markers, glues, scissors, and crayons to make paper pilgram hats, indian headbands,leaf rubbings, or tracing their hands to make turkeys keeps them busy while your working in the kitchen. Another idea is rolling out some white butcher paper across the table so everyone coming to dinner can decorate the “tablecloth”. Set out a jar of crayons or markers to let everyone create Thanksgiving art , write down what they are thankful for this year, or their favorite Thanksgiving memories from years past. This could be fun for grown ups and kids alike. Play a family game.~ A game of Bingo with prizes if you have a large crowd coming over would be a good after dinner activity. Have everyone bring a wrapped “prize” either dollar store trinkets, small box of candy, a Thanksgiving card with a few dollars or lottery tickets enclosed. No one knows what they will get so it adds to the game. Watch some football! ~ The guys won’t need much encouragement for this one. Take a nap~ Again you won’t have to tell some people twice. The Turkey with all the trimmings~ Your feast may differ slightly but here is a sampling of what might be on the table. Make a joyful noise unto the Lord, all the lands! we are his people,and the sheep of his pasture. Enter his gates with thanksgiving and his courts with praise! What are you thankful for this year? ~ Going around the table asking each person what they are most thankful for this year.